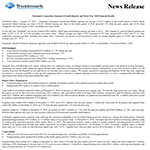 JACKSON, Miss.--(BUSINESS WIRE)--Trustmark Corporation (NASDAQ:TRMK) reported net income of $36.7 million in the fourth quarter of 2018, which represented diluted earnings per share of $0.55. Diluted earnings per share in the fourth quarter of 2018 increased 1.9% from the prior quarter and 14.6% when compared to the fourth quarter of 2017 excluding non-routine items. Printer friendly version of earnings release with consolidated financial statements and notes: http://www.businesswire.com/cgi-bin/mmg.cgi?eid=51929380&lang=en. For the full year, Trustmark’s net income totaled $149.6 million, which represented diluted earnings per share of $2.21. This compares to reported diluted earnings per share in 2017 of $1.56, or $1.92 excluding non-routine items. Diluted earnings per share in 2018 increased 41.7% from reported EPS in 2017 and 15.1% when compared to earnings per share excluding non-routine items. Trustmark’s net income in 2018 produced a return on average tangible equity of 12.86% and a return on average assets of 1.11%. Trustmark’s Board of Directors declared a quarterly cash dividend of $0.23 per share payable March 15, 2019, to shareholders of record on March 1, 2019. Loans held for investment totaled $8.8 billion at December 31, 2018, an increase of 1.0% from the prior quarter and 3.1% from the same period one year earlier. During the quarter, growth in other real estate secured loans ($90.1 million), state and political subdivision loans ($44.6 million), construction, land development and other land loans ($25.1 million) and residential mortgage loans ($24.5 million) was offset in part by declines in commercial and industrial loans ($27.2 million) and loans secured by nonfarm, nonresidential properties ($73.4 million). Acquired loans totaled $106.9 million at December 31, 2018, down $25.7 million from the prior quarter. Collectively, loans held for investment and acquired loans totaled $8.9 billion at December 31, 2018, up 0.7% from the prior quarter and 1.3% from the prior year. Deposits totaled $11.4 billion at December 31, 2018, an increase of $407.5 million, or 3.7%, from the previous quarter and $786.9 million, or 7.4%, year-over-year. Both the linked quarter and year-over-year increase reflects growth in personal and public fund balances. Trustmark’s capital position remained solid, reflecting the consistent profitability of its diversified financial services businesses. During the fourth quarter, Trustmark repurchased approximately $54.5 million, or 1.8 million shares of its common stock. At December 31, 2018, Trustmark had $36.9 million in remaining authority under its existing stock repurchase program, which expires March 31, 2019. The repurchase program, which is subject to market conditions and management discretion, will continue to be implemented through open market repurchases or privately negotiated transactions. At December 31, 2018, Trustmark’s tangible equity to tangible assets ratio was 9.31%, while its total risk-based capital ratio was 13.07%. Tangible book value per share was $18.24 at December 31, 2018, up 5.1% year-over-year. Nonperforming loans totaled $61.6 million at December 31, 2018, down 9.2% from the prior quarter and 8.8% year-over-year. Other real estate totaled $34.7 million, reflecting a 5.0% linked-quarter decrease and a 19.8% year-over-year reduction. Collectively, nonperforming assets totaled $96.3 million, reflecting linked-quarter and year-over-year decreases of 7.7% and 13.1%, respectively. Allocation of Trustmark's $79.3 million allowance for loan losses represented 0.99% of commercial loans and 0.57% of consumer and home mortgage loans, resulting in an allowance to total loans held for investment of 0.90% at December 31, 2018. This represents a level management considers commensurate with the inherent risk in the loan portfolio. In aggregate, the allowance for both held for investment and acquired loan losses represented 0.90% of total loans held for investment and acquired loans. Net charge-offs totaled $11.8 million in the fourth quarter resulting from resolution of two specific problem credits which were fully provisioned in prior periods. Unless noted otherwise, all of the above credit quality metrics exclude acquired loans. Revenue in the fourth quarter totaled $148.7 million, down 3.5% from the prior quarter, reflecting higher interest expense as well as a seasonal reduction in noninterest income. Net interest income (FTE) in the fourth quarter totaled $108.4 million, resulting in a net interest margin of 3.56%. Compared to the prior quarter, net interest income (FTE) decreased $1.7 million, as growth in total interest income was more than offset by increased total interest expense. During the fourth quarter of 2018, the yield on acquired loans totaled 9.89% and included $1.1 million in recoveries from the settlement of debt, which represented approximately 3.52% of the annualized total acquired loan yield. Excluding acquired loans, the net interest margin (FTE) for the fourth quarter of 2018 remained stable at 3.50% when compared to the third quarter of 2018, as growth in the yield on the loans held for investment and held for sale portfolio, runoff of maturing investment securities, and favorable funding mix were offset by higher costs of interest-bearing deposits. Net interest income (FTE) in 2018 totaled $432.2 million, resulting in a net interest margin (FTE) of 3.54%; excluding acquired loans, the net interest margin (FTE) was 3.46%. Noninterest income totaled $43.6 million in the fourth quarter, down from the prior quarter primarily because of seasonally lower insurance commissions and reduced mortgage banking revenue. In the fourth quarter, bank card and other fees totaled $7.8 million, an increase of 3.9% from the prior quarter, while service charges on deposit accounts totaled $11.1 million, up 0.4% from the prior quarter. Other income, net increased $546 thousand linked quarter, primarily due to an increase in other miscellaneous income. Insurance revenue in the fourth quarter totaled $9.6 million, reflecting a seasonal decrease of 11.2% from the prior quarter and an increase of 8.5% compared to one year earlier. Insurance revenue in 2018 totaled $40.5 million, up $2.3 million, or 6.0%, relative to the prior year. The solid performance in 2018 reflects increased business development efforts and initiatives that supported enhanced productivity. Wealth management revenue totaled $7.5 million in the fourth quarter, a decrease of 3.7% when compared to the prior quarter and 2.8% from levels one year earlier. The decrease is primarily attributable to lower trust and investment management revenue. Wealth management revenue in 2018 totaled $30.3 million, in-line with the prior year. Trustmark remained focused on servicing clients and realigned processes to enhance productivity. Mortgage banking revenue in the fourth quarter totaled $5.7 million, down $2.9 million from the prior quarter. The linked-quarter decrease reflects a decline in the fair value of loans held for sale, reduced secondary marketing gains, and negative mortgage servicing hedge ineffectiveness. Mortgage loan production in the fourth quarter totaled $303.7 million, a seasonal decrease of 23.7% from the prior quarter and a 10.0% decrease year-over-year, primarily due to lower refinancing activity and higher interest rates. In 2018, mortgage banking revenue totaled $34.7 million, up 16.0% from the prior year, reflecting increased secondary marketing gains, positive mortgage servicing hedge ineffectiveness and increased mortgage servicing income. Mortgage loan production totaled $1.4 billion in 2018, up 3.4% from the prior year despite an extremely competitive third party origination environment. Diligent expense management continues to be a priority for Trustmark. Core noninterest expense, which excludes other real estate expense ($61 thousand) and intangible amortization ($1.3 million), totaled $102.6 million in the fourth quarter, a decrease of $181 thousand on a comparable basis from the prior quarter and an increase of $1.8 million from the prior year. Salaries and benefits totaled $58.7 million in the fourth quarter, down 3.5% linked quarter primarily due to a seasonal decline in insurance commissions. Services and fees increased 9.2% from the prior quarter, reflecting higher spending on outside services and fees, data processing and advertising. Other real estate expense totaled $61 thousand during the fourth quarter, representing a 94.8% decrease compared to the prior quarter. Other expense totaled $12.3 million in the fourth quarter, an increase of 4.8% from the prior quarter primarily due to increased miscellaneous fees. As previously announced, Trustmark will conduct a conference call with analysts on Thursday, January 24, 2019, at 8:30 a.m. Central Time to discuss the Corporation’s financial results. Interested parties may listen to the conference call by dialing (877) 317-3051 or by clicking on the link provided under the Investor Relations section of our website at www.trustmark.com. A replay of the conference call will also be available through Thursday, February 7, 2019, in archived format at the same web address or by calling (877) 344-7529, passcode 10127330. Trustmark Corporation is a financial services company providing banking and financial solutions through 196 offices in Alabama, Florida, Mississippi, Tennessee and Texas. Certain statements contained in this document constitute forward-looking statements within the meaning of the Private Securities Litigation Reform Act of 1995. You can identify forward-looking statements by words such as “may,” “hope,” “will,” “should,” “expect,” “plan,” “anticipate,” “intend,” “believe,” “estimate,” “predict,” “potential,” “continue,” “could,” “future” or the negative of those terms or other words of similar meaning. You should read statements that contain these words carefully because they discuss our future expectations or state other “forward-looking” information. These forward-looking statements include, but are not limited to, statements relating to anticipated future operating and financial performance measures, including net interest margin, credit quality, business initiatives, growth opportunities and growth rates, among other things, and encompass any estimate, prediction, expectation, projection, opinion, anticipation, outlook or statement of belief included therein as well as the management assumptions underlying these forward-looking statements. You should be aware that the occurrence of the events described under the caption “Risk Factors” in Trustmark’s filings with the Securities and Exchange Commission could have an adverse effect on our business, results of operations and financial condition. Should one or more of these risks materialize, or should any such underlying assumptions prove to be significantly different, actual results may vary significantly from those anticipated, estimated, projected or expected. Risks that could cause actual results to differ materially from current expectations of Management include, but are not limited to, changes in the level of nonperforming assets and charge-offs, local, state and national economic and market conditions, including potential market impacts of efforts by the Federal Reserve Board to reduce the size of its balance sheet, conditions in the housing and real estate markets in the regions in which Trustmark operates and the extent and duration of the current volatility in the credit and financial markets as well as crude oil prices, changes in our ability to measure the fair value of assets in our portfolio, material changes in the level and/or volatility of market interest rates, the performance and demand for the products and services we offer, including the level and timing of withdrawals from our deposit accounts, the costs and effects of litigation and of unexpected or adverse outcomes in such litigation, our ability to attract noninterest-bearing deposits and other low-cost funds, competition in loan and deposit pricing, as well as the entry of new competitors into our markets through de novo expansion and acquisitions, economic conditions, including the potential impact of issues relating to the European financial system and monetary and other governmental actions designed to address credit, securities, and/or commodity markets, the enactment of legislation and changes in existing regulations or enforcement practices or the adoption of new regulations, changes in accounting standards and practices, including changes in the interpretation of existing standards, that affect our consolidated financial statements, changes in consumer spending, borrowings and savings habits, technological changes, changes in the financial performance or condition of our borrowers, changes in our ability to control expenses, greater than expected costs or difficulties related to the integration of acquisitions or new products and lines of business, cyber-attacks and other breaches which could affect our information system security, natural disasters, environmental disasters, acts of war or terrorism, and other risks described in our filings with the Securities and Exchange Commission. Although we believe that the expectations reflected in such forward-looking statements are reasonable, we can give no assurance that such expectations will prove to be correct. Except as required by law, we undertake no obligation to update or revise any of this information, whether as the result of new information, future events or developments or otherwise. See Notes to Consolidated Financials. Mississippi includes Central and Southern Mississippi Regions. Tennessee includes Memphis, Tennessee and Northern Mississippi Regions. The allowance for loan losses balance related to the remaining loans acquired in the Bay Bank merger, which were transferred from acquired impaired loans to LHFI during the second quarter of 2018, and the remaining loans acquired in the Heritage acquisition and the Reliance merger, which were transferred from acquired impaired loans to LHFI during the third quarter of 2018. The efficiency ratio is noninterest expense to total net interest income (FTE) and noninterest income, excluding security gains (losses), amortization of partnership tax credits, amortization of purchased intangibles, and significant non-routine income and expense items. The regulatory capital ratios for December 31, 2017 contain a reclassification adjustment of $8.5 million from AOCI to retained earnings as allowed by regulatory agencies in an interagency statement released January 18, 2018 to address disproportionate tax effect in AOCI resulting from the recent enactment of the Tax Cuts and Jobs Act of 2017 and the application of Financial Accounting Standards Board Accounting Standards Codification Topic 740, Income Taxes. At December 31, 2018, the net unamortized, unrealized loss included in accumulated other comprehensive loss in the accompanying balance sheet for securities held to maturity previously transferred from securities available for sale totaled approximately $15.7 million ($11.8 million, net of tax). Management continues to focus on asset quality as one of the strategic goals of the securities portfolio, which is evidenced by the investment of approximately 97% of the portfolio in GSE-backed obligations and other Aaa rated securities as determined by Moody’s. None of the securities owned by Trustmark are collateralized by assets which are considered sub-prime. Furthermore, outside of stock ownership in the Federal Home Loan Bank of Dallas, Federal Home Loan Bank of Atlanta and Federal Reserve Bank, Trustmark does not hold any other equity investment in a GSE. Reflected in the table above are yields on earning assets and liabilities, along with the net interest margin which equals reported net interest income-FTE, annualized, as a percent of average earning assets. In addition, the table includes net interest margin excluding acquired loans, which equals reported net interest income-FTE excluding interest income on acquired loans, annualized, as a percent of average earning assets excluding average acquired loans. During the fourth quarter of 2018, the yield on acquired loans totaled 9.89% and included $1.1 million in recoveries from the settlement of debt, which represented approximately 3.52% of the annualized total acquired loan yield. Excluding acquired loans, the net interest margin remained flat at 3.50% for the fourth quarter of 2018 when compared to the third quarter of 2018, as growth in the yield on the loans held for investment and held for sale portfolio, runoff of maturing investment securities, and favorable funding mix were offset by higher costs of interest-bearing deposits. Trustmark utilizes a portfolio of exchange-traded derivative instruments, such as Treasury note futures contracts and option contracts, to achieve a fair value return that offsets the changes in fair value of mortgage servicing rights (MSR) attributable to interest rates. These transactions are considered freestanding derivatives that do not otherwise qualify for hedge accounting under generally accepted accounting principles (GAAP). Changes in the fair value of these exchange-traded derivative instruments, including administrative costs, are recorded in noninterest income in mortgage banking, net and are offset by the changes in the fair value of the MSR. The MSR fair value represents the present value of future cash flows, which among other things includes decay and the effect of changes in interest rates. Ineffectiveness of hedging the MSR fair value is measured by comparing the change in value of hedge instruments to the change in the fair value of the MSR asset attributable to changes in interest rates and other market driven changes in valuation inputs and assumptions. Trustmark invests in partnerships that provide income tax credits on a Federal and/or State basis (i.e., new market tax credits, low income housing tax credits and historical tax credits). The income tax credits related to these partnerships are utilized as specifically allowed by income tax law and are recorded as a reduction in income tax expense. Trustmark received $24 thousand, $13 thousand and $1.2 million of nontaxable proceeds related to bank-owned life insurance during the fourth quarter of 2018, the third quarter of 2018 and the second quarter of 2018, respectively. Trustmark received no nontaxable proceeds related to bank-owned life insurance during the first quarter of 2018 compared to $1.7 million during the fourth quarter of 2017. These proceeds were recorded in other miscellaneous income in the table above. Trustmark adopted ASU 2017-07, “Compensation-Retirement Benefits (Topic 715)-Improving the Presentation of Net Periodic Pension Cost and Net Periodic Postretirement Benefit Cost” effective January 1, 2018 and was required to reclassify the defined benefit plans non-service cost from salaries and employee benefits to other expense on the consolidated statements of income for each period presented. During 2013, a deferred tax valuation allowance was created as a result of Trustmark’s merger with BancTrust Financial Group, Inc. and was established to reduce deferred tax assets to the amount that was more likely than not to be realized in future years. Trustmark has continually evaluated this allowance since inception and, based on the weight of the available evidence, has determined that the deferred tax assets will not be subject to the limitations on the deductibility of built-in losses (Internal Revenue Service Code, Section 382) in future years. Therefore, during the fourth quarter of 2017, the valuation allowance was eliminated creating a decrease in deferred income tax expense of $8.7 million. Following the recent enactment of the Tax Reform Act which resulted in the reduction of the corporate federal income tax rate, Trustmark re-measured its net deferred tax assets and recorded an increase in deferred income tax expense of $25.6 million during the fourth quarter of 2017. In addition to capital ratios defined by U.S. generally accepted accounting principles (GAAP) and banking regulators, Trustmark utilizes various tangible common equity measures when evaluating capital utilization and adequacy. Tangible common equity, as defined by Trustmark, represents common equity less goodwill and identifiable intangible assets. Trustmark believes these measures are important because they reflect the level of capital available to withstand unexpected market conditions. Additionally, presentation of these measures allows readers to compare certain aspects of Trustmark’s capitalization to other organizations. These ratios differ from capital measures defined by banking regulators principally in that the numerator excludes shareholders’ equity associated with preferred securities, the nature and extent of which varies across organizations. In Management’s experience, many stock analysts use tangible common equity measures in conjunction with more traditional bank capital ratios to compare capital adequacy of banking organizations with significant amounts of goodwill or other tangible assets, typically stemming from the use of the purchase accounting method in accounting for mergers and acquisitions. These calculations are intended to complement the capital ratios defined by GAAP and banking regulators. Because GAAP does not include these capital ratio measures, Trustmark believes there are no comparable GAAP financial measures to these tangible common equity ratios. Despite the importance of these measures to Trustmark, there are no standardized definitions for them and, as a result, Trustmark’s calculations may not be comparable with other organizations. Also there may be limits in the usefulness of these measures to investors. As a result, Trustmark encourages readers to consider its consolidated financial statements in their entirety and not to rely on any single financial measure. The following table reconciles Trustmark’s calculation of these measures to amounts reported under GAAP.